The Teflon is getting thinner and thinner for the Nature Boy Ric Flair. The former NWA world champion is once again at odds with his employer TNA Wrestling. Two weeks after what appeared to be Flair playing games with the company, TNA has left Flair off their Impact booking sheets. It all started last weekend when Flair was booked for some rare appearances on a weekend of TNA Wrestling house shows. Flair was advertised for an autograph session and a live appearance for a TNA show in Brooklyn, NY. Flair appeared for the signing but disappeared for the rest of the night leaving fans and even fellow TNA workers a little surprised. According to one report, Flair claims that the reason he never went during the show is because he was never told about that part of the gig. Even Dave Meltzer who is generally a Flair supporter didn’t have much of a defense for Flair. After the incident a few months back where Flair held up TNA for his draw during a house show run in Europe, most saw this as another case of Flair playing games with the company. According to one report, several of Flair’s fellow TNA wrestlers weren’t happy with the WWE Hall of Fame wrestler. I rarely defend Flair these days but, I may in this case. If Flair is telling the truth and was booked without being told about the live appearance I think he is right not to go out. You are kidding yourself if you think Flair has the same passion about going out and promoting the company as a lower tier wrestler making a few hundred bucks a night. This is a business for Flair as it should be, and if he was only booked for an autograph signing he owes the company nothing to give them a free live appearance. With TNA Wrestling’s track record of blunders is it that hard to believe that nobody told Flair about the second half of the gig? To someone like Flair it may have been perceived that TNA was trying to pull a fast one, getting two bookings for the price one. If he is not telling the truth, knew about the two appearances, and played dumb, well then he deserves all of the criticism he is getting. The odd way in which Flair no-showed really put the company in a tough spot. Fans were left feeling ripped off and remember, this was the New York market. Not that you want to screw fans over anywhere, but soiling a show in this particular market could be disastrous. If Flair had just not shown up or given notice that he wouldn’t have been there, TNA could have offered a replacement. Instead, they were left with their pants down in New York City. It would appear that it was a simple miscommunication as Flair not only showed up as advertised the next day in Asbury Park, NJ for the second show, but appeared at both the signing and the live event. Flair even cut a promo promoting his appearance on Impact Wrestling and mentioned that he would be going for the TNA championship. Not so fast Nature Boy! It didn’t surprise many people when word leaked out (presumably by Flair himself) that Ric Flair was left off of the booking sheets for this week’s TNA Impact Wrestling tapings Monday and Tuesday. In addition to costing Flair money, he will be left off television for the next few weeks. It would also be safe to assume that this would leave Flair off of TNA Hard Justice since he won’t be on television to promote it, thus once again costing Flair some major bucks and television time. Once again if Flair was right and was only booked for an autograph signing, the company is being extremely petty here in penalizing a legend. Unfortunately it appears for Flair that he has worn off any good will with the numerous incidents he has had while in the company and won’t be given the benefit of the doubt here whether he was or wasn’t notified of the appearance. At this rate I don’t know why TNA Wrestling is keeping Flair on the payroll if they aren’t going to use him. 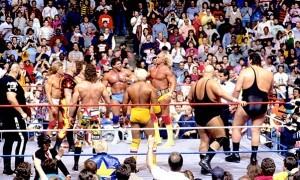 I am a Ric Flair fan inside of the ring, but outside of the ring he has probably done more damage to his reputation in the last three years than anyone other than Hulk Hogan. He hasn’t moved the meter, he hasn’t brought in buyrates, and he certainly hasn’t gone out of his way to promote the company so why bother? I don’t think anyone would sympathize with TNA for letting him go at this point. So why get into this shell game with a guy who is sitting home laughing with all the guaranteed money you already pay him? Keep in mind that as I write this on Monday that this could all change by bell time. It wouldn’t shock me at all to see TNA book Flair at the last minute to try and “one up” the pro wrestling media. However, I highly doubt that Flair is willing to play that piece of the game after the latest turn of events.